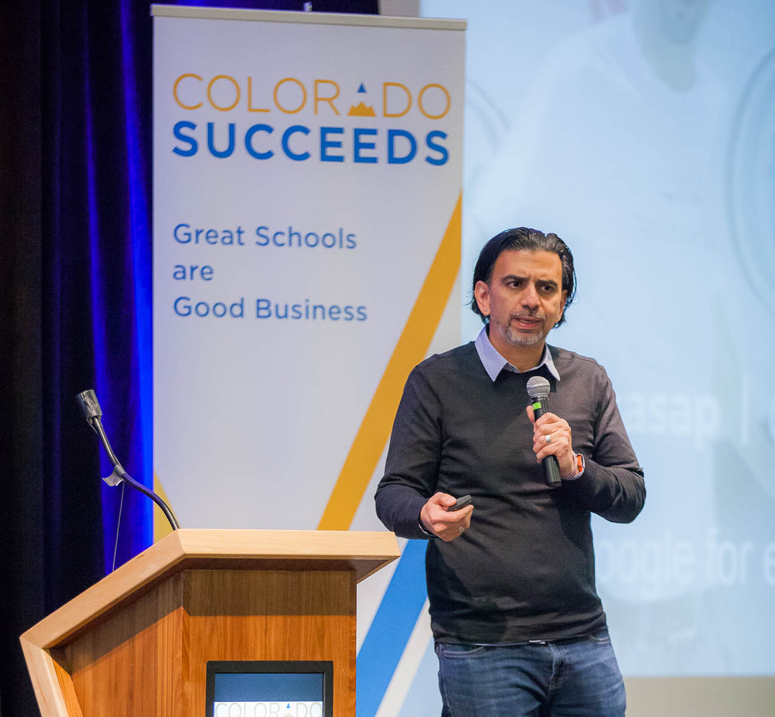 Sean Wybrant, Colorado’s 2017 Teacher of the Year, along with other Colorado education leaders attended a dinner with Google’s Jaime Casap organized by Colorado Succeeds. During that dinner Casap, the company’s Chief Education Evangelist, explained how he approaches education, looks at it through the viewpoint of problem-based learning, and what innovation actually looks like. Innovation is a word thrown around all the time in education and other industries right now regardless of whether or not it really describes the situation or approach to learning. Using a SMART Board? Innovative. Using an iPad as a book? Innovative. Creating a holographic computing experience? Innovative. 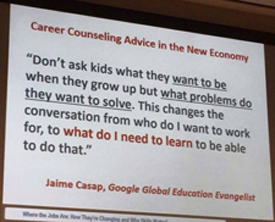 If there is someone that can help clarify what innovation is and what it isn’t, it is Jaime Casap, Chief Education Evangelist at Google. I showed up to the evening dinner early because traffic on the way to Denver was lighter than expected. One of my students had just put the most recent version of his holographic Periodic Table of the Elements onto our HoloLens, so before dinner I pulled it out to explore the changes in the restaurant as I was waiting for the others to arrive. Kellie Lauth, the principal from STEM Launch in Colorado, joined me and asked what I was looking at. As I was showing her the project, Jaime arrived. After being greeted by the others in the group who had begun to arrive and were milling, I had the chance to introduce myself and he asked to see Jaiden’s project. “Have you heard of the Google Science Fair?” he asked me. When I told Jaiden, my student, that those were some of the first words Jaime had to say about his project, you should have seen his pride. It was a moment of realization for that student, a moment where his belief that he could make a difference was cemented and became real. Jaime changed one of my kids’ lives without realizing it. That is what he does. Do you use Google Apps for education? Do you have Chromebooks? Those are two of the initiatives that Jaime Casap discussed at dinner. He described the process of moving those initiatives into the K-12 space to provide a better learning experience and opportunity for all. He discussed equity. 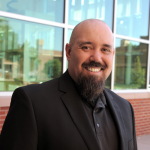 He talked about his efforts to help open a new school in Arizona for students to learn how to solve problems with technology and meaningful instructional opportunities. He talked about his own upbringing and why he is fiercely passionate about equity. He filtered the conversation through his experience now as a parent. He was humble as he described each of these initiatives, and he was realistic about why a business should want to invest in kids from a benefit to the business perspective. He also talked about why they should want to from a “let’s make the world a better place” perspective as well. He went on to explain that above the ground beaming stations may be a much better way to relay information quickly from one location to another and would require a far smaller investment and potential maintenance as the technology is improved in addition to the difficulty of laying fiber in some remote areas. As he was explaining about this kind of way of looking at the problem it was clear that most, if not all, of us at the table were not used to looking at the problem from this perspective. Plus, you know…it was the Education Evangelist of Google that was saying it so that changes how one looks at it. To be honest, sitting at a table with the heads of many educational organizations, schools, and businesses, as well as Colorado’s education commissioner made me a little nervous so I talked a little more than I probably should have. At the same time, it was a moment for me – one that made something concrete: as Colorado Teacher of the Year, my voice is valued and people around the table listened as intently to me as they did to Jaime. On the occasional times when Jaime reinforced my statements about educational focuses and the role of standardized testing and what authentic assessment might look like through his words or his nods, I realized that I really can make a difference both by being at tables like that and by sharing my thoughts/opinions. I have travelled some since that night as the Teacher of the Year and in the quiet times where I am feeling stressed or tired or worried I think back to that night where Jaime explained how he was tired from his crazy speaking schedule, an admission of humanity we rarely see from people in high profile positions. Meeting Jaime before he went on to do a presentation the next day was inspiring as much for his down to earth, authentic, passionate responses as for hearing about the kinds of world changing ideas and goals he has helped roll out for the benefits of students the world over. Thanks, Jaime for your conversation and your work. This was originally published on Sean’s website, Crafting Heroes.